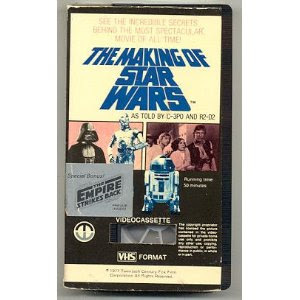 Originally released to the home video market in 1979 by the then-fledgling Magnetic Video corporation, this is the rarest of Star Wars material on video. I spent the better part of a year and a half looking for this original video at a reasonable price and I finally recently found it! This is the original version as it was aired on ABC-TV in 1978 with Robert Conrad as narrator and not the 1995 version that was re-dubbed with a different narrator’s voice and broadcasted on the Sci-Fi channel. It’s also the first piece of Star Wars material, predating even the VHS release of Episode IV: A New Hope, by two years. 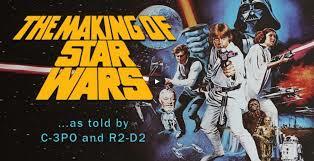 (Lucasfilm and Fox would not officially Originally aired on ABC in 1977, this special features behind-the-scenes footage from the sets, the visual effects, interviews with the cast and creators of the legendary film. Interviews with Mark Hamill, Carrie Fisher, George Lucas, and Gary Kurtz are featured on this video narrated by the late William Conrad. This special was only reissued once in the United States on video in its original format, as part of a double feature with a similar special on The Empire Strikes Back. The video and audio quality is typical for late 1970’s video releases, with the source print being a 16mm print. Also, attached to most of the Magnetic Video prints is a trailer for The Empire Strikes Back that is not present with the current trilogy DVD set. The only other U.S. video release of this special is a 1995 reissue through a mail-in offer with Kellogg’s Cereals, which replaces William Conrad’s voiceover with another actor. The rest of the special is similar to its initial appearance.